But this year, even though the produce departments are brimming with artichokes, peas of all kinds, asparagus, greens, strawberries and rhubarb, I have been too busy to think very much about anything other than work. Of course work for me means I'm cooking...but I haven't had much time to record what I'm doing...much less take a lot of pictures (I've just been racing to get dinner on the table before I move on to the next thing....). Fortunately, since I have always wanted to do a post on Tarte Flambée, I already have pictures.... So it seems that the moment for featuring this classic from France has finally arrived. 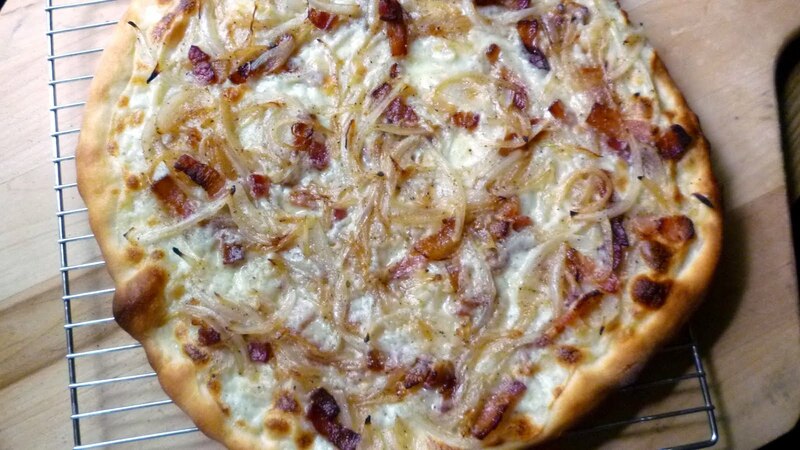 If you have never encountered Tarte Flambée, it is somewhat like a white pizza...with bacon. 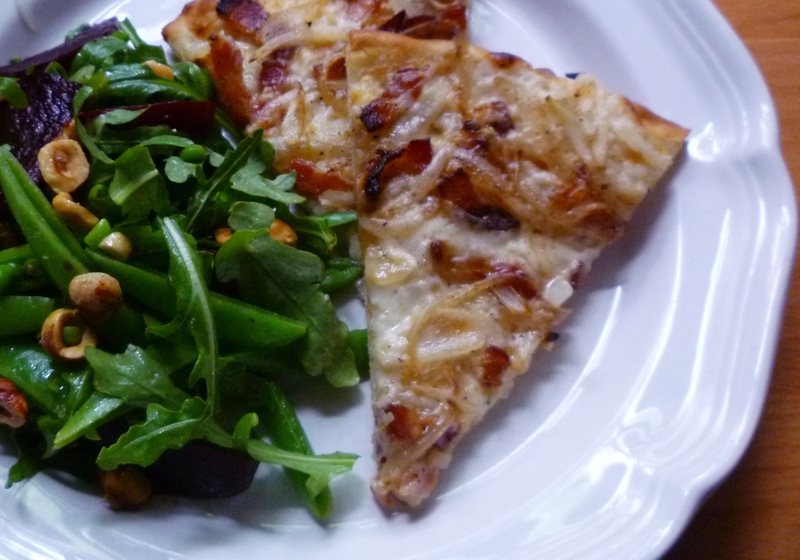 In fact, it is often referred to as the pizza of Alsace. I have always heard that the origins of this tart lie in the village bread ovens of Alsace. Once a week, when the ovens were fired up for bake day, the local workers and farmers would take advantage of the intense heat of the freshly fired oven—which would have still been too hot to bake bread—to make a quick lunch. The ingredients—a scrap of yeast dough, fresh cheese, bacon and onions—would have been readily available, so it would have been the simple, sensible and delicious thing to do. I'm not sure where and when I first encountered this delicious tart. I know that I had it once many years ago at a home in Normandy. I was totally enamored by it, but unfortunately didn't get the recipe. I also remember watching Andre Soltner make his restaurant version (on puff pastry instead of a simple yeast dough) many years ago. The video for this version is still available on line and is well worth watching. When I make it now, it is Soltner's topping that I use on a traditional yeast dough crust. 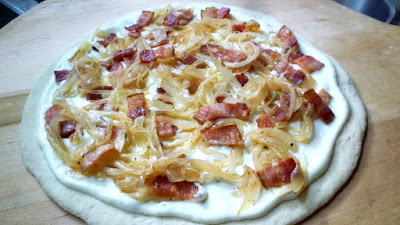 Apparently in its original guise the bacon and onions would have been placed raw onto the cheese smeared round of dough. In the wood fired oven, the flames—attracted to the rendering fat—would have reached up and over the tart, singeing the edges of the tart and the tips of the bacon and onions. The name—Tarte Flambée (in French) or Flammekueche (in the dialect of Alsace)—is a reference to this: the tart is 'cooked in the flames'. In most home settings, Soltner's method of rendering the bacon a bit first is a great idea since it avoids a flood of bacon grease in the oven. Not surprisingly, there are many, many recipes for Tarte Flambée available on line (it is one of the most famous dishes from Alsace). If you have never tried it, I hope you will give my recipe—or one of the others—a try. 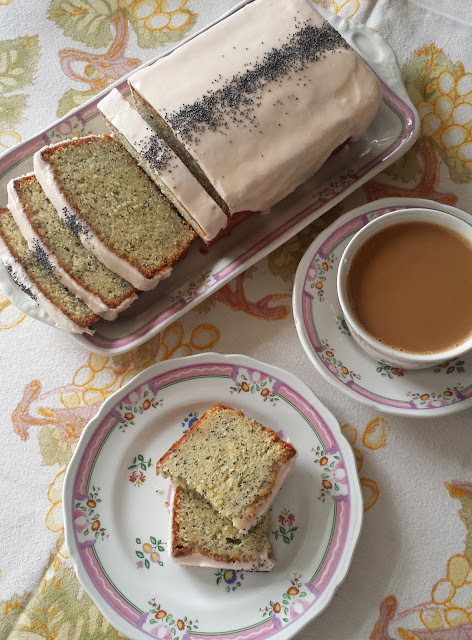 I am of course partial to mine, but most recipes are similar and I would only encourage you to avoid recipes that use a heavier hand with the topping. As delicious as it is, adding more doesn't make it more delicious, it just makes it soggy and greasy. There are some great variations out there—a scattering of Gruyère for a finishing touch...a few sautéed mushrooms added to the mix...even a dessert version with apples and cinnamon sugar (instead of bacon and onions).... But I admit... I have never tried one of these. Maybe someday. For now, I think it's perfectly delicious in its original (and simplest) form. Combine the water, yeast, and 1 1/4 cups of the flour in a large bowl. Whisk until smooth. Add the butter and salt and beat until the butter is incorporated. Begin stirring in the remaining flour, adding just enough flour to form a soft dough that holds its shape. Sprinkle some of the remaining flour on a smooth surface. Scrape the dough out of the bowl and sprinkle with a bit more flour. Knead the dough, adding just enough flour to keep the dough from sticking, until the dough is smooth and springs back when pressed lightly with a finger—about 10 minutes. Transfer the dough to a lightly buttered bowl and cover the bowl with plastic wrap. Let the dough rise until it has doubled in size—about 1 hour. 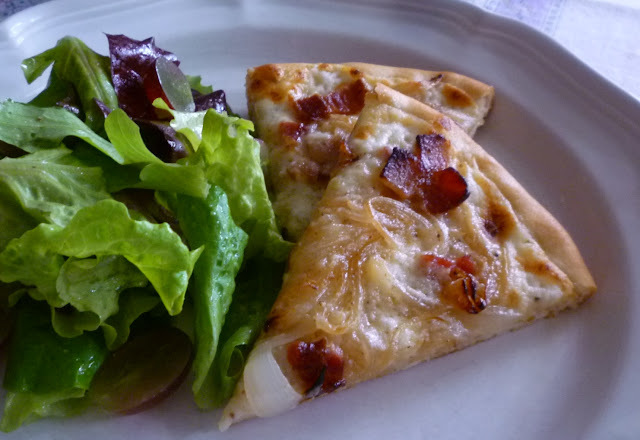 Note: Originally, Tarte Flambée was a snack made with extra dough in the community bread baking oven while the oven was still too hot to bake bread. Any simple dough will work. Use a half pound of dough per tart. Preheat oven to 500°F. If you have a baking stone, place it in the oven while the oven is heating. In a large sauté pan, set over medium low heat, cook the bacon until most of the fat is rendered and the bacon is beginning to color—it does not need to be crisp. Drain off the excess fat and increase the heat to medium. Add the onions and sweat until just wilted—they should still have a bit of crunch. If you removed too much of the bacon fat...or the onions look dry, you may add back some of the bacon fat that you poured off. Remove from the heat and season generously with freshly ground black pepper. Set aside. 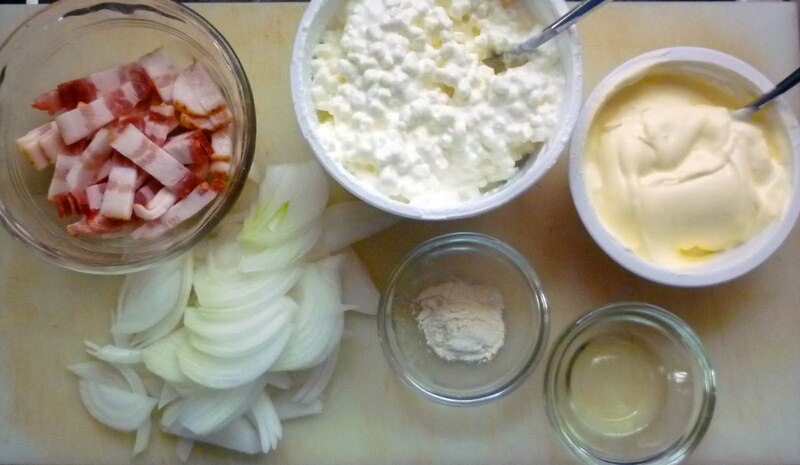 While the bacon and onions cook, place the cottage cheese in the food processor and process until smooth. Add the crème fraîche, oil & flour and process in. Season to taste with salt and pepper and set aside. Punch down the dough and divide it in half and form each half into a ball. Place the balls on a flour dusted counter and cover the balls of dough with a towel and let rest for 10 to 15 minutes. Working with one ball of dough at a time, stretch or roll the dough out (with lightly floured hands or on a lightly floured surface) to make a thin circle that is about 10-inches across. Transfer the dough to a semolina dusted peel or pizza pan/baking sheet. 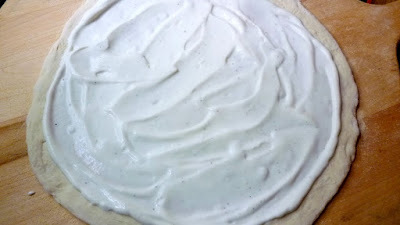 Spread half of the crème fraîche mixture over the crust, leaving a half-inch border. 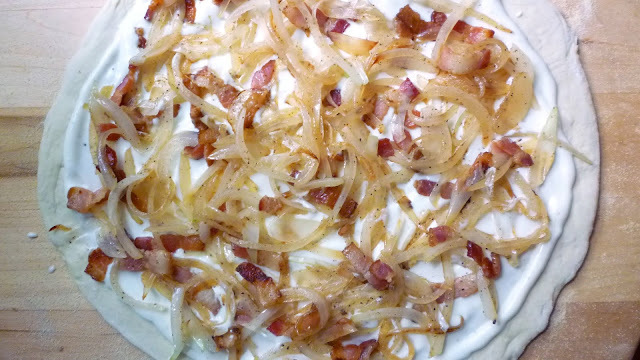 Scatter half of the onion and bacon mixture over the cream. If using a pizza pan or baking sheet, place the tart in the pan on a pre-heated pizza stone in a pre-heated 500° oven. To insure a crisp crust, slide the pizza off of the pan and directly onto the pizza stone as soon as the crust is set (after 4 or 5 minutes). If using a peel, slide the pizza directly onto the preheated baking stone. 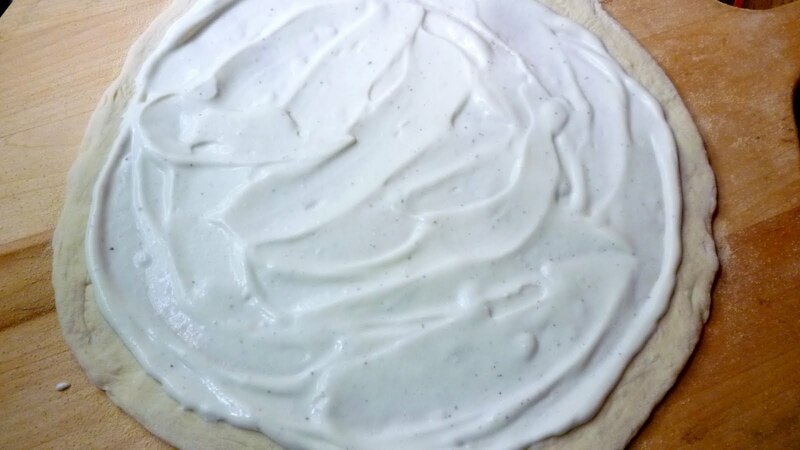 Bake the tart until the edge of the crust is crisp and brown, the cream is bubbling and golden and some of the tips of the onions are beginning to caramelize, about 8 to 15 minutes (time depends greatly on your oven). Quickly build and bake the second tart while you enjoy the first. If you happen to have two stones, build and bake both the tarts at the same time. Makes 2 tarts, serving 8 as a first course or 4 as an entrée. 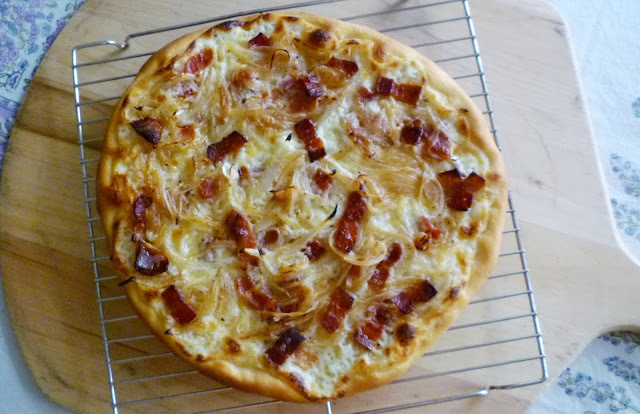 I have no recollection now of where I heard this, but I remember being told once that the white onion—which is sweeter than a yellow onion—is the best choice for this tart. Since it makes a delicious tart, I have never been inclined to make it with anything else. Sold at most supermarkets. 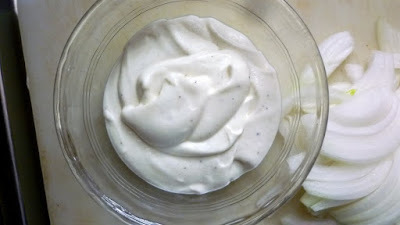 If unavailable, heat 1 cup whipping cream to lukewarm (85° F). Remove from heat and mix in 2 T. buttermilk. Cover and let stand in warm, draft-free area until slightly thickened, 24 to 48 hours, depending on temperature of room. Refrigerate until ready to use.